Lipid Deposit? In the eye? Who knows about this stuff? Stan developed a white spot on his eyeball several months ago. It hasn't gotten worse, or better. It just appeared one day and hasn't gone away. Anyone know about lipid deposits in piggy's eye? ps - my vet said that's probably what it is, that's where I got the info that it might be that. I'll try to post a pic of it later. I think lipid=fat. I seem to remember a bone or calcium deposit on rare occasion showing up in the eye but don't remember anything else about it. In the eye? Cavies are known for osseous choriostomas, or bony deposits in the eye and "pea eye" or fatty protrusion of an eye gland near the corners of the eye. Okay, here's a closeup of his eye. It's the higher up white hunk in there. Yikes, it's kinda creepy that big! Anyhow - if anyone knows anything about them, I'd like to learn more. Hi MommaOf2Piggies, that's a great pic and I copied it to the board. Let me know if that's okay with you. Last edited by Lynx on Wed Feb 09, 2005 7:42 pm, edited 1 time in total. Gavin has similar white spots on his eye. 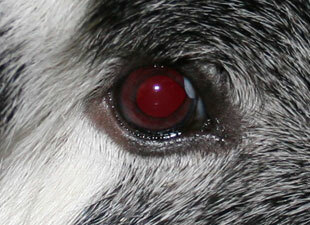 A vet thought that it was corneal dystrophy, but didn't really know for sure. With Gavin we did a stain, and his eye was perfectly normal. The white spots have grown since then (this was 3 years ago), and we assumed that they might eventually impact his vision. However, he went blind from a completely unrelated illness (cataracts) so it's a moot point. Osseous choristomas are classified as tumors, aren't they? Meg has those white spots in the middle of her eye. However, many of my old folks have depigmentation of the edge of the eye, which looks kind of like that photo. Meg has the most serious case -- so she always looks like she is surprised because there is white all around her pupils now. My vet says that this depigmentation is associated with age. My vet didn't seem like she was concerned about it whatsoever. I will have to ask Dr. Steve about it if Stan has to go in to meet him anytime soon. (hopefully NOT). Hello! I’m not sure how old this thread is, but it was very helpful to me! My little boy Ed has these similar spots and I freaked out thinking it was something dangerous, and my mom and I cannot afford a vet bill right now. Thankfully, it isn’t anything life-threatening. Thanks for all the info!